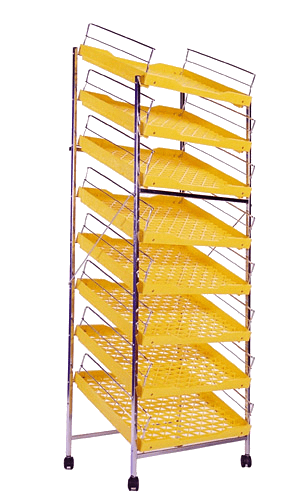 Gravity Feed Racks & Displays | Drader Manufacturing Industries, Ltd.
Accompanies the Bread Carriers and Bread Trays to keep your product visible in a retail setting and displays looking fuller for longer. The Gravity Feed Display is a perfect accompaniment to our Drader Bread Carrier. As a loaf of bread is pulled out, the next one will slide forward keeping your displays looking full for longer. The angle provides an appealing display, and to restock you need only to pull out the empty Carrier and slide in a new one. Comes with wheels and folds up for easy moving and storage.